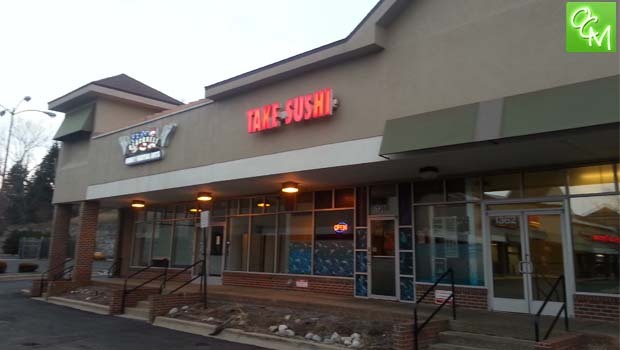 Take Sushi Rochester Hills Review, hours, and menu info. Take Sushi is located in Rochester Hills MI on Walton Blvd near Livernois. One of the highest-rated sushi restaurants in Oakland County, I couldn’t wait to review Take Sushi. Take Sushi is a small cozy restaurant that fills up with diners on busy nights. There are Japanese style open grills for diners. The setup is tight but entertaining. The Take Sushi menu has a ton of sushi offerings. Many of the familiar rolls… California, Rainbow, etc… and many unique and original rolls. The menu is conveniently divided up into different categories – Sushi & Sashimi, Maki Sushi-Raw, Maki Roll-Cooked, Maki Roll-Vegetarian, and Nigiri Sushi. You can also order different roll and sushi combinations. Take Sushi also serves soup and salad, and entrees such as teriyaki dishes, bibimbob, tempura dishes, bulgogi, and more. Take Sushi offers a lunch menu. I tried the Take Sushi Rochester Hills Sunny California roll (a California roll with spicy tuna on top) and the Alaskan Roll (salmon, avocado and cucumber). Both were well prepared and extremely fresh. Take Sushi also included a nice portion of ginger which I love because I typically run out. I got take out and placing the order was easy. The staff was super nice and accommodating. When my husband went to pick it up, they had even put an ice pack in the bag to keep it fresh! The lady who took my order knew that we might not be right on time picking it up, so she packed the order with the ice pack. The staff was kind and helpful. Other than having some of the best sushi in Oakland County, Take Sushi is also known for their great service.